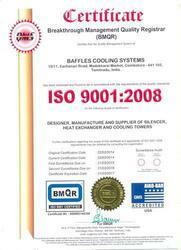 Recognized as the leading manufacturer, wholesaler and exporter enterprise, "Baffles Cooling Systems", is providing world class range of Heat Exchanger & Silencer since the commencement in the year 2013. Our enthusiastic business culture empowers us to attain ISO 9001:2008 certifications. Our attempts to understand the trend in the market demands equips us to expand our product selection by serving full benefits of cost competitiveness, maximum performance, high durability and low-cost maintenance. We make every reasonable work in fulfilling the specified requirements of our valuable clients by performing leading technological elevations in our business operations. Besides, to face the business challenges our workforce is fully lined with highly advanced infrastructure. We connect our business procedures to our agreement with our authorized origin of the raw material and logistics partners. Their resourcefulness and enthusiastic attitude participate in our agile success and does us proud to serve best in the class heat exchanger and cooling tower to some most recognized clients. Our Director "Mr. M. Venkatesh", is an ambitious marketing persona, who has a stock of different industrial expertise. His administration acts as knowledge associate for us to produce useful in heightening our competency and fired growth. B.C.S should be provide O.T.D. (On Time Delivery) of Products and Whose performance and appearance are in accordance with our tradition of High Precision Manufacturing Standards. We appreciate our employees as all are the greatest asset to the company. We owe recognition to the tireless contributions of our extremely encountered product engineers, experienced price analysts, quality control executives, enlightened marketing experts and skilled workforce. Due to their learned approach and fulfilling personalities we are capable of achieving outstanding outcomes to our prestigious patrons. ASME Section VIII Div 1 of ASME Boiler and Pressure Vessel Code unfired Pressure Vessels. 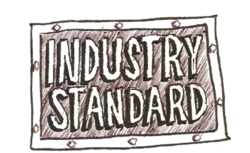 Applicable Heat and Mass Transfer Standards. 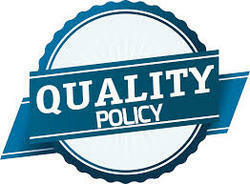 Quality is at the core of our founding principles that drives us to define a clear set of guidelines. We aspire to follow the stringent rules specially designed to attain the highest level of customer satisfaction. 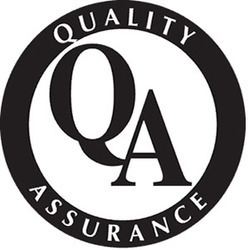 To make sure that our business operations are commenced in compliance to the defined norms and regulations, we operate a team of certified quality insurance experts. They engage the responsibility to make error free products convenient for shipment. Our highly sophisticated infrastructural set-up shows the capability of our organization for discharging specialized as well as standard business activities. Growth of the company, enhancement of our process and elimination of production intricacy lie in the adequacy of our infrastructural set-up. With the help of our infrastructure, we are capable making delivery of bulk consignment within committed period of time. 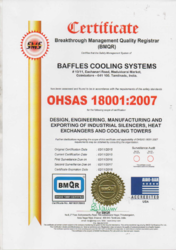 Baffles Cooling Systems committed to meeting customer requirements through continual improvements of our quality management Systems. We shall sustain organizational excellence through timely responsiveness, quality consciousness ,visionary leadership , employees participation and innovative efforts. Our responsibility to endow our valuable clients with highest quality products earned us a repute of industry leaders. Our determined efforts to exceed their expectations make us responsible to answer the goals and objectives of our customers by operating closely with their application-specific requirements. Apart from this, our offered quality and nominal price range are providing us a competitive advantage and furnish us to come up with new and advantageous features in our line of products. B.C.S. to build on our history of Product Excellence and Technology innovation to provide the highest Quality and most Reliable Products and Services to Worldwide Customers. We maintain a superior level of integrity in Interactions with Business associates.